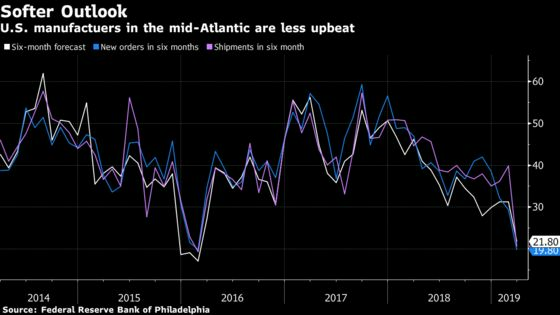 (Bloomberg) -- The six-month outlook for manufacturing in America’s mid-Atlantic region slumped to a three-year low, another sign that expectations for weaker global growth may be weighing on producers. The Federal Reserve Bank of Philadelphia’s index for future activity fell 9.5 points to 21.8 in March, dragged down by lower readings for expectations for shipments and new orders, according to the report released Thursday. The main gauge of regional conditions rebounded from a February reading that was the lowest since mid-2016 to 13.7 this month. “Respondents continue to expect growth over the next six months, but most readings have been trending lower,” the reserve bank said in its report on manufacturing conditions in the region, which covers central and eastern Pennsylvania, southern New Jersey and Delaware. The reading comes a day after Fed policy makers said economic growth has slowed from its solid rate in the fourth quarter and adds to signs that manufacturers may face mounting challenges. The Institute for Supply Management’s gauge of American factories fell to a two-year low in February as orders, employment, production and deliveries all dropped. The regional Fed’s gauge of expectations for shipments six months from now plunged 19.3 points to a three-year low of 20.5 while the measure for new orders fell 9.6 points to 19.8, the lowest since September 2001.